Lego has already dabbled in this world with its Lego Mindstorms line. But those kits can potentially intimidate at the 11 to 14-year-old level, both in complexity and design. Mindstroms tend toward a black and red color palette, with builds that lean heavily on cyberpunk sci-fi imagery. Think “robots with mohawks.” By contrast, the Spike Prime set aims for accessibility, opting for bright colors, friendly shapes, and drag-and-drop coding tools that gently nudge students towards learning. 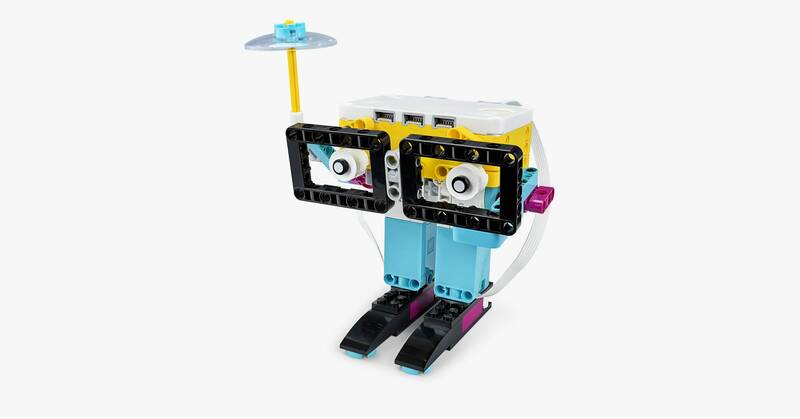 Lego envisions students in the classroom working in pairs on creations that range from a breakdancing robot to a weather forecaster to a grasshopper-like racing module; there are 33 lesson plans in all, each structured to last 45 minutes. (Because this is Lego, you’re naturally also welcome to go off-book.) The kit contains a whopping 523 pieces—an expansion kit ups the total to 603—that are roughly color-coded to help guide the middle school audience through the process of sorting out which does what. A yellow centralized hub drives the action; all the wheels are blue, the sensors black, and so on. But as anyone who mis-stacked a brick in the last few decades knows, Lego products are forgiving of mistakes. In fact, with Spike Prime, mistakes are encouraged.